I see the Copic Chatter threads all the time and I am SO not a copic girl. It's primsas all the way here! Now there are all sorts of threads from people just getting started and asking where to buy and what paper to use, but I thought I'd try a chatter thread to swap coloring ideas! Todays topic - What are your go to colors for pants? I do jeans more than just about anything. I start with a layer of Blue Slate and then shade in with Periwinkle and tone it all down with Indigo Blue. That combo lets me work from new denim to much loved faded jeans. For brown pants, my second choice on a figure, I snag Sepia and then shade in with the various tones of French Grey. 90% and 50% are a favorite, but I like pulling 30% in as well for highlights. pepperann, tex8798, Pattyann11 and 6 others like this post. are you talking about the pencils or the markers? I use both the Prisma markers and the Copics interchangeably but it would be nice to hear more about the specific colors instead of being hit or miss each time! Sorry! I meant pencils! I don't even think "markers" when I think Primsacolors. Jannarama, Sharon 73 and JasonRider like this post. And, not to hijack the thread, but you can use Prisma markers with Copics? I haven't tried the Prisma markers yet. I take it they are alcohol inks, too? That's good to know. What a fabulous idea for a thread! I have just been trying out my prismacolor crayons. I got a package of the Scholars and some storebrand odorless mineral spirits. I've been having trouble with ink smearing though. I've tried Memories black, brilliance graphite, black, versafine onyx, palette noir and stazon. All ran except stazon. I was using SU whisper white paper each time. smittysgirl and JasonRider like this post. I just saw this thread. Glad to see others love their Prismacolor Premier colored pencils, too! I am using Memento Tuxedo Black ink for EVERYTHING now. I love it and I can stamp images ahead of time and not worry about what I can use to color the images. It does not bleed or smear with ANYTHING! I use Gamsol, watercolor pencils, and even copics with Memento and I have NO problems. For white card stock to stamp images on, I now use Neenah Classic Crest Avalanche White 80lb. cover. It's great and I can use that for everything, too. cnbehrendt, Jannarama, TeaScrap and 2 others like this post. Originally Posted by Karen Stamps! I've had some trouble too, but I think different paper helped. SU is really just made for their own markers & inks. I actually found the BEST results on watercolor paper--more vivid colors. TeaScrap and JasonRider like this post. Will the Gina K cardstock I just ordered work well with the pencil/gamesol method? Absolutely! Gina K's pure lux baseweight is my preferred cardstock of choice for pencil/gamsol. Although, in my case, I use baby oil. It's super smooth and the color just seems to float when I blend. Awesome stuff. I'm getting ready to order up some of the Vanilla for when I do vintage stuff. Karen - For ink, I agree with Kitty14. Memento Tuxedo black all the way. Actually, I've also used their brown to color an image in sepia tones like a vintage photograph. It worked just as fabulously as the black. So you don't have to use just black when you're coloring! When I'm doing up digital images, I print with a laser printer. No bleeding there. Laser prints melt the toner into the paper as part of the printing process. This should be a great thread, because I use pencil and gamsol. 90 percent of all my cards are done with Georgia Pacific from Walmart, pencil and gamsol, I have never had a problem with this paper. But right now I am trying to find information or a site on coloring skin tones?? Sharon 73 and JasonRider like this post. Skin are always a bear, aren't they? Right now my figures are all pasty white Caucasians as I've just been playing with the peach tones in my pencils. Someone recently recommended the Lyra Skin tone pencils. I checked them out today at Hobby Lobby, but from what I could tell they were colors I pretty much already have in my Prismacolor 120 set. Prismacolor also has a portrait set which was loaded with those same colors, plus others I would expect for hair and eyes. Again, I've got the colors in my set, but it did point me towards colors to try. I think I'm going to see if I can find some portrait images in clip art to print off and play with for color tones. tcmccagh, Sharon 73 and JasonRider like this post. I have the the 120 set plus , I need to know how to work color for races, black, Indian, Asian, since I am new , I need basic info on color and how toos, . What cardstock do you recommend for Prisma pencils and gamesol (sp?)? My absolute favorite cardstock for gamsol & Prismas is shimmery white. The color slides so well on that surface. I stamp with black Stazon as my favorite, but I have used SU basic black with decent results. Mine too! I also use it for watercoloring, and for pretty much any sentiment stamping too. I also use Black Stazon, Timber Brown Stazon, or the gray Stazon. I'm going to have to come back and read through all this when I'm done. I just bought some Prismas and used them with mineral spirits for the first time last night! I use Mementos Black and Versafine Sepia. I like the sepia ink for a vintage look and when I use pastel shades. Oh! That sounds pretty! I'm going to have to try the sepia and pastels! I use Pallete inks. They are great hybrid inks that don't smear. I'm always reaching for them. I have always used Stazon Jet black and Georgia Pacific cs with my Prismas. Haven't had a problem. tcmccagh and JasonRider like this post. Thanks for starting this thread. Great idea!! This is what I use as well as my Tuxedo black memento. I agree! thanks for starting this! I'm always up for great tips and ideas since I'm fairly new to the prisma pencils myself. I use Bic Mark-It's for markers when I have to but, I really prefer my Tombow Watercolor markers. As someone with a tiny crafting budget, does the blending/gamsol technique work with the Prismacolor Scholar pencils? Or do I need to get the expensive art quality pencils? I'm really interested in learning to use pencils to colour my images. I also wanted to add that using the blending stumps I ordered from Gina K are SO much nicer than the ones I was using from M's. They just seem to blend a little better. I usually am a lurker, but this thread has drawn me in. What a great idea for a thread. I have just started using my prismacolors. I had a friend over last Thursday and we colored together for three hours and I learned so much from her. She doesn't use anything to blend except her pencils and wow, does she do good work. I did a barn that I am particularly proud of (my 2nd real piece and I only used the pencils as well). We used Bristol paper from Strathmore papers. I still want to try the other blending methods, in time. Need to master one technique at a time. Prismacolor Premier pencils are soft thick-cored pencils, so they will work the best for the blending. However, I've used even crayola pencils with some success. Not great success, mind you, but some. Okay, I zipped over to Primsacolor's site to look up the Scholar pencils. They are listed as "Smooth, creamy texture of richly pigmented colors". I can't see why you wouldn't get good results with these. The full set color range is smaller than the Premier's, but overall with creative blending, you should do fine! As you find you need more colors, I would suggest looking to the Premiers in open stock to fill out your color range. Hmm...they don't have color names on the Scholars, but comparing the two, it looks like if you replace the 3 in the color number with a 9, you can find the comperable Premier pencil. For example the cream pencil in Scholar is 314 and in Premier it's 914. That may help you when you're adding in other colors later on down the road. Sharon 73 likes this post. Awesome thread! I love my copics, but also love using prismacolor pencils. So when you color jeans (for example) you use different colors? I usually just outline and then pull the color in with a blending stump. Can someone explain the steps to get AWESOME results? I don't know that I get "awesome" results, but I'm pretty happy with the ones I get. I start by lightly coloring in the pants entirely with the lightest color. I blend that out so it's smooth. I'll then go in with my darkest color and pencil in the areas that are shadowed. I usually go fairly heavily here and then blend from the darkest shadow to the lightest. I'll then go back in with my mid-tone and hit areas that I want darker, but not shadowed. Occasionally, after all that, I'll go back with my lightest tone fairly heavily over my highlights and then blend out. Now these are dragons, not denim, but they're a good example of what I'm talking about. 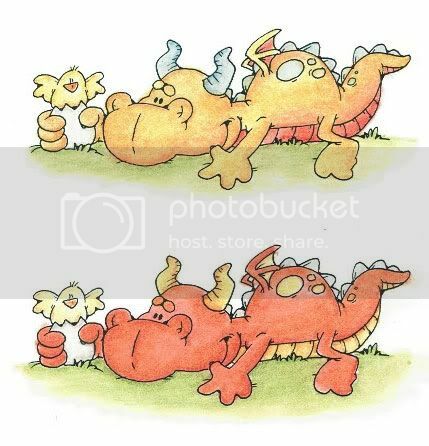 The top dragon is shaded out with 3 tones of yellow and orange, while the bottom dragon is actually shaded out with 3 tones of orange and red, plus an additional layer of Burnt Umber. It really isn't as much work as it sounds. Normally, when I'm working on an image, I'll start by completely coloring it with all my light tones. When I'm ready to pull out my baby oil, then I start working on my shading. Keep in mind that everyone's technique and style varies. Try different things until you figure out what works best for you! tcmccagh and Sharon 73 like this post. Thanks so much for the "how to" I am going to give it a try this weekend. Thanks! So much of coloring is just trial and error and see what you like. One thing I still do that I learned in art classes years ago is to decide where your light is coming from and mark the point on the edge of your work area that won't show on the finished piece. That way you have a visual reference for shading and shadowing. Oh, I just checked out your Etsy site. Your squirrels are just darling!! I may need a couple of those. I love my Prismacolor pencils too! I have not used anything else to color with since I bought them back in September. I like the look of Copics but I cannot afford all the colors that I would want. So I bought the set of 120 pencils and I am super happy with my results. I love coloring this way. I have even been teaching classes at my local scrapbook store about this technique. I have had two classes so far and one more to go for May. It has been a big success! BTW, I use baby oil instead of gamsol (OMS). I found that I was getting headaches even though it is supposed to be odorless. Check out my tutorial on my blog. I use Archival Jet Black ink from Ranger on Georgia Pacific white card stock from Wal-Mart. I have never had any problems with bleeding or smudging either. jenny09125 and cnbehrendt like this post. Great thread! Prisma's are my main coloring source. I'm still learning to use them, but I'm going to give a shout out to Paula. She is AMAZING with her coloring!! I dream to be like her!! Glad you joined in. I'm just starting to color with pencils more. I love coloring! I need practice. I think there is a world of information on this thread, and more to come! (borrowed from the quirkey card sayings thread). Not sure if anyone answered this for you, sorry if it's a repeat. I had the same problem. I bought Ancient Page ink at the suggestion of an SCSer and haven't had any probloems since. I have been told Memento ink is also very good but I can't get that locally here. HTH. BTW - OP - great idea! I am a real novice at coloring so seeing what others do hoepfull yhelps me get beyond my 1st grade renditions!! LOl! That's a great tutorial. Thanks so much for sharing! OMGosh! I saw this thread and thought...hmmm....markers...Then, I read down...PENCILS! Now, those are MY FAVS for color choices. I use the PC904 and PC902 for jeans, and for khakis I use PC945 and Pc941. Oh Heck Yeah! Paula's blog is gorgeous! It's my go to when I can't think of how a color combination is going to look. I know if I flip through a few pages of her cards I'll find one like what I'm wanting, plus a dozen more I want to try. Wow...thanks for all the info!